In a comprehensive and unified program of conservation, designed to replace scarcity with abundance, forestry and forest lands commonly occupy a key role. They may provide a continuing flow of products to satisfy human wants; and they may ensure the protection of soil, water flows, and local climate, without which food and agriculture in many lands will continue to deteriorate. They may, then, hold the whole task of conservation together. The global loss of tropical forests mounted slowly for several centuries, then began a rapid acceleration during the 1940s. The increase occurred for many reasons; the most important undoubtedly was the expansion of agriculture in all of its forms. Export crops and beef production degraded or replaced incalculable extents of tropical forest and wetland and savanna, as if the forest itself had no biological or even economic value. The benefits of these industries to investors and consumers have been enormous, constituting the primary driving force behind this great ecological transformation. But the value of the forest itself has also risen on local and global markets, primarily in the form of timber products. As the tropical timber products industry became industrialized, wood products joined foods as a major commodity that northern economies could harvest from tropical lands, 1 and as light railways, heavy-wheeled vehicles for grading roads and hauling timber, and more efficient multipurpose sawmills became available to meet rapidly increasing global demand, forests retreated before the logger as well. The United States provided markets for tropical hardwoods beginning in the eighteenth century. In the twentieth century the market for tropical hardwoods accelerated, but as a portion of total U.S. hardwood consumption, it was always minute. Domestic hardwoods like oak, maple, and walnut provided as much as 99 percent of each year's market. In terms of harvests in some tropical countries, the American market for tropical hardwood produced major ecological impacts. To make the picture more complex, the flow of timber between the United States and the tropics was reciprocal, for Pacific and Caribbean markets were important for American conifer lumber from the late nineteenth century on, when the U.S. timber industry began looking for foreign customers in order to diversify its markets and stabilize its operations. Americans played four major roles in the expanding scale of tropical forest exploitation: as investors and consumers, and as loggers and foresters. Logging companies measured their effectiveness largely in terms of the expanding scale and efficiency of the extraction of wood products. A foreign mahogany logger was aware of his lack of knowledge, but he could recognize a tall, straight mahogany trunk even if he found only one per acre- and that was enough for him. Professional foresters saw their effectiveness increasingly in terms of managing the forests for a sustainable yield of wood products. Although foresters studied tropical ecosystems, coming over the course of decades to understand their complexity, fragility, and limited extent, most of their time was spent studying commercially important species, since no species had any "value" unless it was recognized by the buyers of finished products. Even more than agronomists and ranch managers, they struggled to understand how to maintain the forest for future human use. By the 1950s some of them had begun to wrestle with the social and ecological issues that are imbedded in forest use. These foresters faced a profound dilemma, which even today is unresolved. Was it possible, by introducing more systematic exploitation of timber resources, to establish sustainable forestry in the tropics and contribute to social welfare into the future? Or would modern timber technology be yet another power in the hands of those who wanted quick profits at the expense of entire ecosystems? Through the work of pioneering American tropical foresters, we can glimpse what the forests of Southeast Asia and Latin American were like at various times, how the patterns of human pressure on them escalated, and how these ecological technicians envisioned the future of domesticated tropical ecosystems. Timber had been a profitable export from the Caribbean Basin since the time of the first Iberian settlements. When American loggers and timber buyers began working the hardwood forests of the Caribbean Basin in an extensive way in the 1880s, they entered a three-hundred-year-old competition among Europeans for capturing treasures like dyewoods and mahogany. Two major forest types were exploited over the centuries. One was lowland moist forest, which contained the precious dye and cabinet woods that grow as individual trees in the midst of many other species. The other was the higher, drier pine forest, useful primarily for inexpensive building lumber. The two stories had different histories, and each history had a distinctive American role. High-grading- felling only the finest trees- was practiced by the first Portuguese to intrude on the Bahia coast of Brazil in the early sixteenth century. These loggers were interested only in brazilwood, which they exported to Europe as a source of red dye. The dye was highly valued in the clothing industry, which was expanding to meet the demand generated by a rising and prospering population. 2 By the end of the 1500s highgrading had reduced the forest along the coasts and riverways to economic insignificance. Constrained by the only timber transport method then available, a team of oxen, loggers rarely penetrated far from waterways or into steep hilly areas. The full diversity of the deeper forest remained. This book is a rich history of the transformation of the tropics in modern times, pointing ultimately to the declining biodiversity that has resulted from the domestication of widely varied natural systems. Richard P. Tucker graphically illustrates his study with six major crops, each a virtual empire in itself—sugar, bananas, coffee, rubber, beef, and timber. He concludes that as long as corporate-dominated free trade is ascendant, paying little heed to its long-term ecological consequences, the health of the tropical world is gravely endangered. 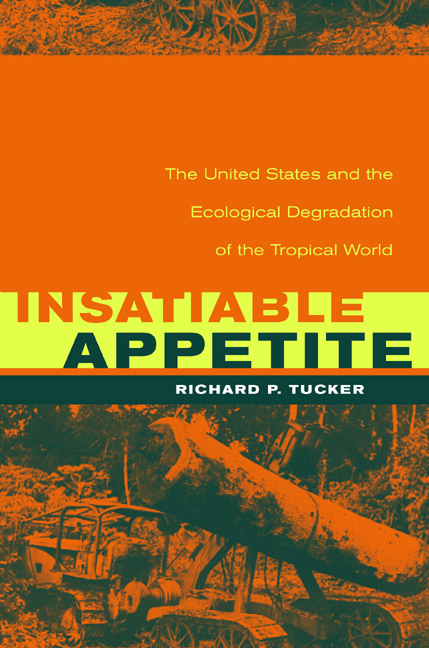 Richard P. Tucker is Professor of Asian and Environmental History at Oakland University, and Adjunct Professor of Natural Resources at the University of Michigan. He is coeditor of Global Deforestation and the Nineteenth-Century World Economy (1983),World Deforestation in the Twentieth Century (1987), and other books.